Anyway, back to the cooking. My dad became quite the chef in the '80's. He had a fondness for veal, so he started serving up dishes to us like veal piccata, veal Oscar (my personal fave!) and veal marsala. But, he didn't stop there. Old school Columbians will remember the classic Greek restaurant "The Elite Epicurean" on Main St. We went there for special occasions, proms, after the ballet, etc. The Epicurean was THE place for lamb in Columbia. But, they also served this crazy dish called "Shrimp, Island of Scorpios" which was shrimp in casserole with feta, tomatoes, onion and ouzo. Dad figured it out, started making it at home and then none of us ever ordered it again because his was better. 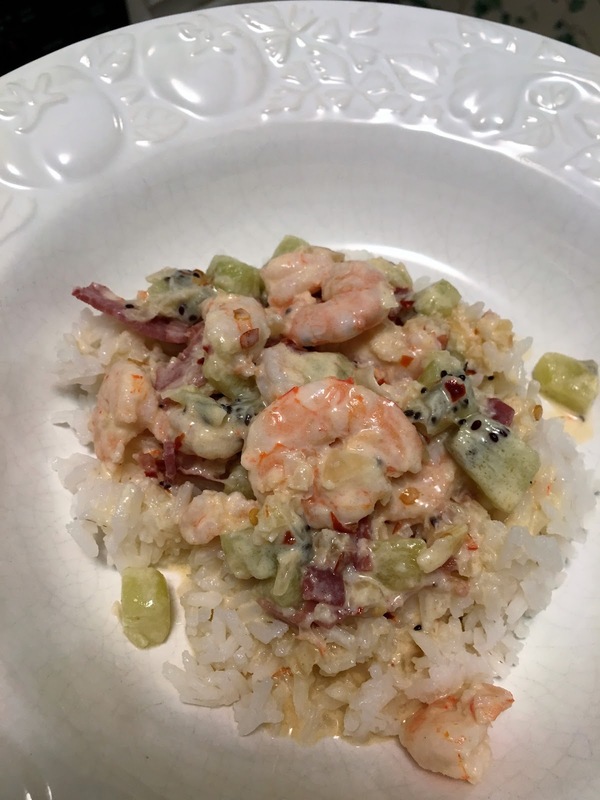 One day, he came across a recipe for shrimp, presumably from a magazine because it was the '80's. We had no Internet, no Google. 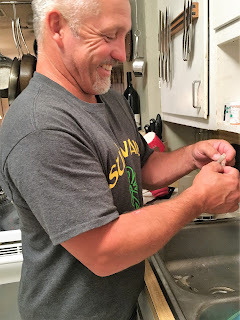 He is a HAM radio operator, but those guys rarely discuss cooking :-) This is the nuttiest recipe ever and quickly became one of our family favorites. I wish I could tell you where it came from, but after all these years, there's no way for me to give credit where credit is due. Therefore, in our family, we simply refer to it as "Dad's Kiwi Shrimp." Having a sous-chef who peels shrimp is a PLUS! OMG: This is getting intense! 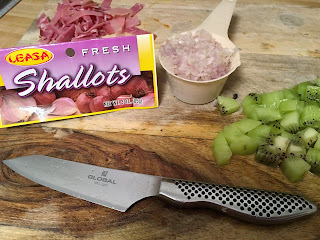 It's amazingly easy and everyone will think you are some kinda genius when you serve it. Heat olive oil over high heat. 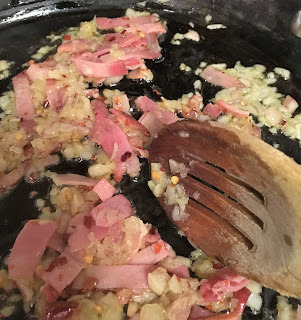 Saute ham, shallot and crushed red pepper about 30 seconds. Add wine & boil until reduced by half (about 2-3 minutes). Add shrimp, kiwi & cream. 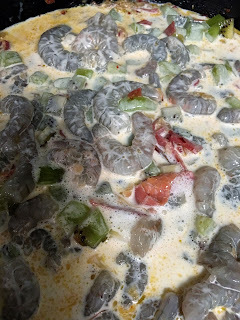 Reduce heat to medium low and cook until shrimp turn pink. Remove them from skillet. Boil sauce 2.5-3 minutes. Add shrimp back in, with salt and pepper. Serve over rice. Yes, I know. It sounds completely crazy, but you're going to have to trust me here. It is simply divine. 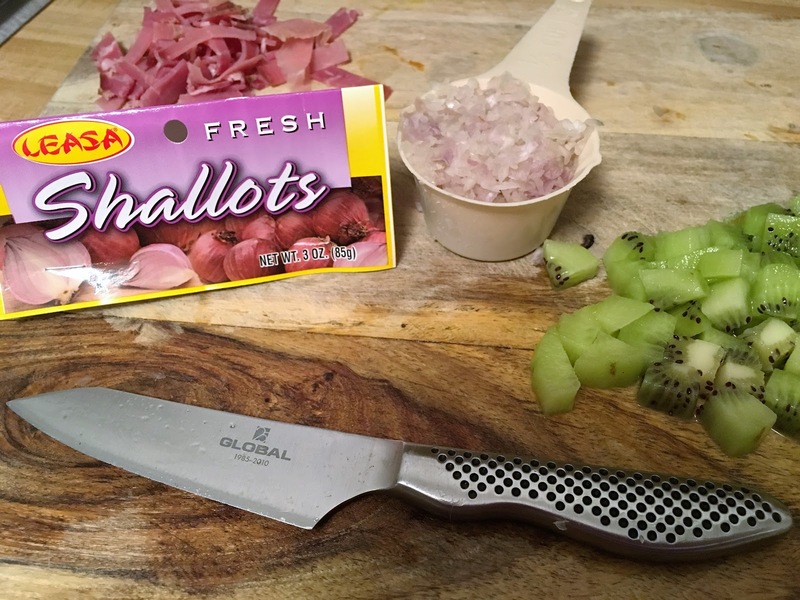 The kiwi gives it a fresh, yet tangy citrus note. Cream...oh, lovely cream. Salty proscuitto, spicy pepper. And SHRIMP! I wonder who it was who discovered how delightful these wacky little creatures taste? So, friends, go out on a limb and try my Dad's dish. Unless you're completely out of your minds, you'll want to send me flowers. Or wine. Or money. Your choice.